An international peer-reviewed journal publishing high quality research and review articles on all aspects of extension program planning, extension administration and management, capacity building, monitoring and evaluation, extension methodologies, farmers psychology, communication models, research methods, extension youth programme, gender discrimination and agriculture, women empowerment, agriculture risks management livestock extension services and management along with all the supplementary issues of rural development. The guidelines of International Journal of Agriculture Extension and Social Development are based on COPE's Code of Conduct and Best Practice Guidelines. Journal is indexed with various databases such as Index Copernicus, CrossRef, Google Scholar, RJIF, Scilit and ResearchBib. 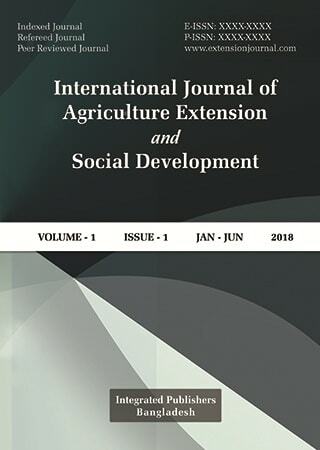 We invite you all to contribute to the International Journal of Agriculture Extension and Social Development (IJAESD). Online submission of the manuscript is strongly recommended. A manuscript number will be mailed to the corresponding author within one week or earlier. Prospective authors can submit their manuscripts at extension.article@gmail.com. Read Instructions to Author for more details. All manuscripts are subjected to peer review process (which are not previously published and are not under consideration for publication by another journal) would be published without any delay in a subsequent issue after acceptance.